Alfred Thomas Heley was born in early 1914 the son of Alfred and Ethel Heley (nee Winstone) of Franklins Farm, Ickford Road, Shabbington, Bucks. Prior to joining the regular army, he was employed by Messrs Holland & Son, printers of Thame, and was also a regular member of the Thame Cricket Club, ‘A’ team. Alfred was serving in the regular army with the Coldstream Guards when war broke out. The 3rd Battalion Coldstream Guards was part of the Western Desert Force fighting Romell’s Afrika Corps throughout North Africa. On 15thApril 1941 the battalion was ordered to attack a German “company” holding the ridge above Sollum (east of Tobruk). The German “company” turned out to be of battalion strength and the Guards could not take the ridge. They withdrew at 5am recording six men killed, nineteen wounded and eleven men missing. Alfred Heley was originally reported as wounded and missing and is now recorded as being killed in the action on the 16th April 1941. 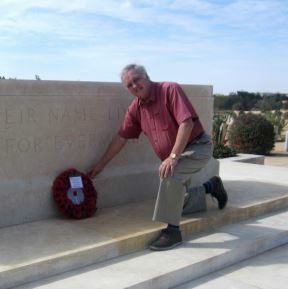 2657231 Lance Sergeant Alfred Thomas Heley, Coldstream Guards has no known grave and is commemorated on the Alemein Memorial in Egypt. He is remembered on a memorial at St Helens Church, Albury.